Give Your H2 The Custom Look It Deserves! Customizing your H2 is half the fun of owning it. 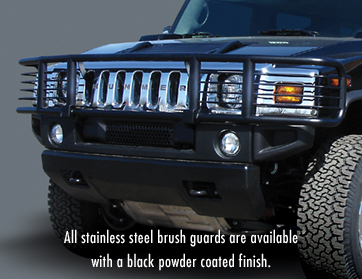 From “mild to wild”, only RealWheels offers such an impressive selection of brush guards to adorn your vehicle. Unlike the common 1” diameter factory brush guards, these heavy-duty styles are produced from a combination of 1-5/8” and 2” diameter polished stainless steel that won’t rust, pit, corrode, or lose its shine. And, like all RealWheels products, these parts are easy to install and come with step-by-step instructions.